Talk about luck. 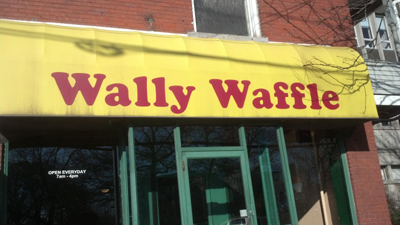 We bumped into Wally Waffle online and days later saw them written up in Cleveland Magazine for breakfast joints. 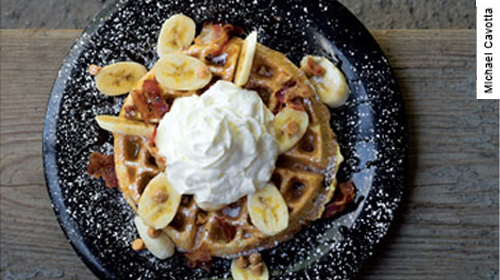 The spread featured a saliva inducing glossy of the Elvis waffle and we were sold. The luck part was showing up the day before they were closing. Fortunately, the doors aren’t being permanently locked, instead they are being bulldozed for yet another hospital expansion. Wally is moving to Market St. to the now void Metro Burger location…almost certainly an improvement. The building appears pretty old in an historic sort of vein and features the products and feel of local artistic smith Don Drumm. The place is pretty packed with people enjoying a leisurely menagerie of breakfast options and we are lead to a table. Our server held her own throughout our stay and seems a part of a bevy of service staff which ought to be able to cover any number of covers with aplomb. 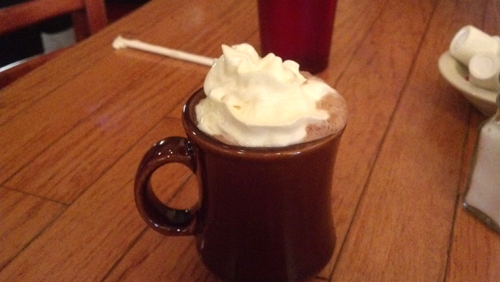 Coffee and hot chocolate kept us warm while awaiting the plates. Steph ordered the aforementioned Elvis and I went with The Hillbilly. 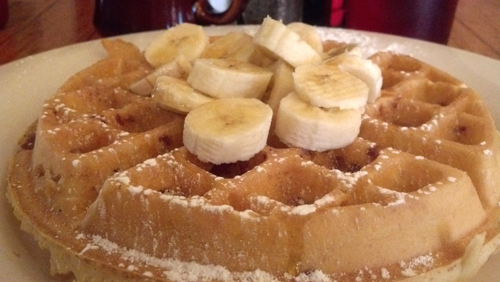 The Elvis waffle is described as a crispy waffle loaded with bacon and peanut butter chips and topped with honey and sliced banana. First off it definitely got some plastic surgery, botox, a visit from Vidal Sassoon and professional make up for its photo shoot in the magazine. The menu description also left me disappointed. Insufficient bacon to make any sort of statement and dry, dry, dry. I don’t know if the person seated behind us was in the know and asked for some butter and syrup or if they just forgot with ours, but the difference is significant. I will say the nanners and the peanut butter were nice and would have been even better if you could taste bacon and get enough lube to swallow a piece without scratching your throat. Disappointing. 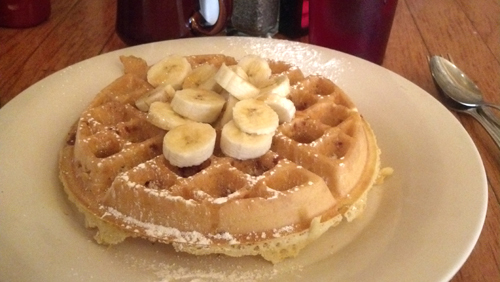 Since we had the waffle covered I went off the signature menu and was instantly attracted to the Hillbilly. 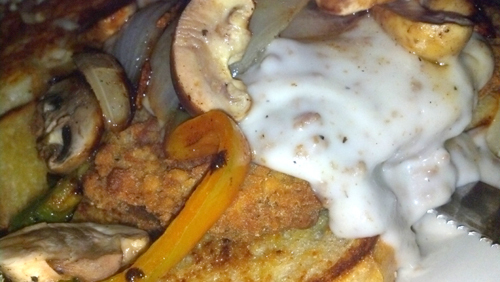 The description reads…Open-faced style…a country-fried steak on grilled Italian bread, smothered in sausage gravy, grilled green pepper, onion and sautéed mushrooms with a side of Wally fries or grits. This was an Olympic improvement over the waffle, which was an easy feat. The bread was very nice as was the steak which was prepared perfectly; perfectly slapping every health conscious rule and regulation with vehement abandon. Add the veggies and about a third of a “smothering” of fairly good sausage gravy and you have an evily satisfying dish. 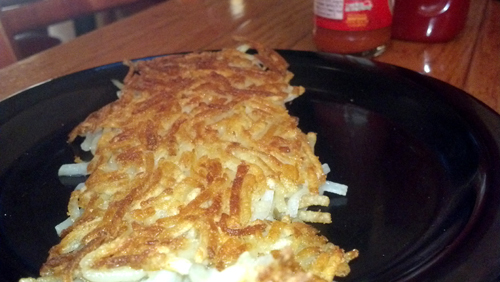 We both ordered Wally Fries which are a run of the mill hash brown but still tasted pretty good. 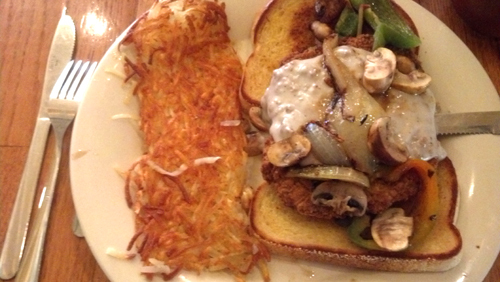 Wally didn’t live up to the hype but they did offer an enjoyable morning meal. It might be a bad week to have gone but I’m sure we will stop by at the new location and check out their lunch options regardless.